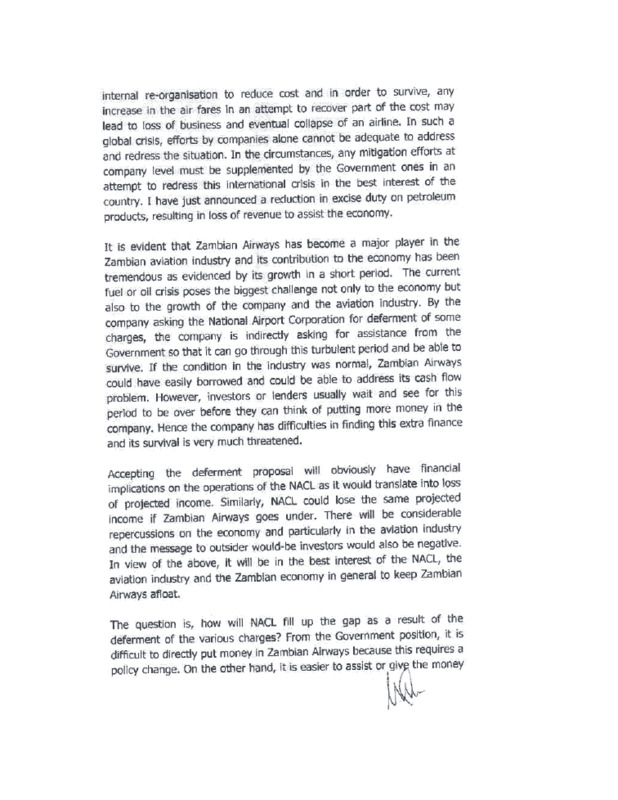 For a while now a letter has been making the Internet circuit specifically Zambian news sites and blogs. I came across the letter and thought it made for an interesting read and sheds new light on an issue that has over the last few months evolved into the Dora fiasco. While I have reservation about the letter, I thought it would make for an interesting discussion. A number of issues come into play here not the least of which is the documents’ authenticity. 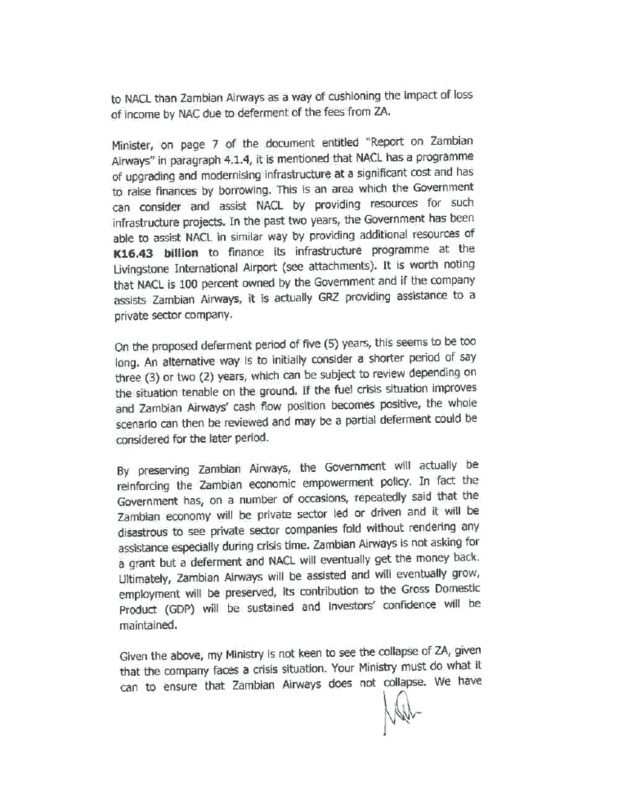 But let’s set that aside and assume if only for a moment that this document was indeed authored by Magande, what evidence is there in this document that Magande was going to cancel Zambian Airways debt? 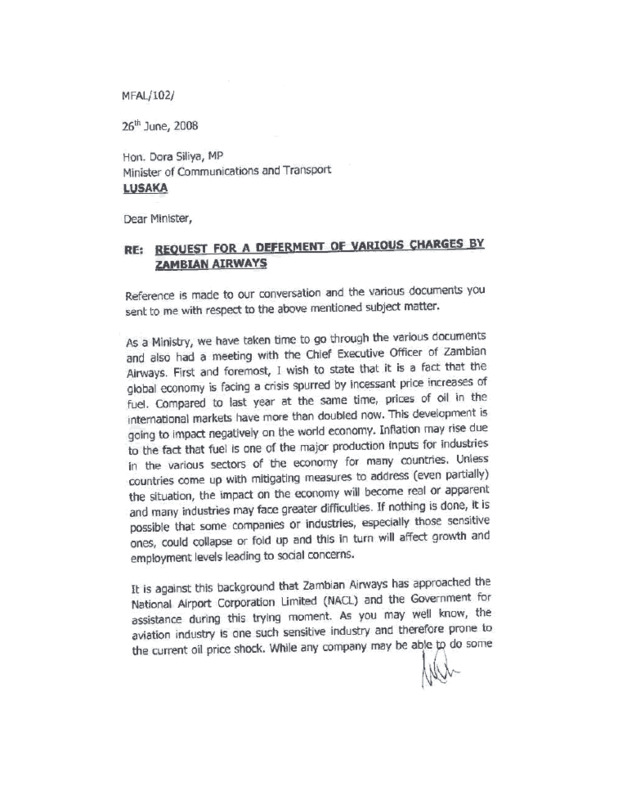 This is the same letter that the President sighted as evidence that Magande was going to cancel Zambian airways’ debt if elected President. What I find particularly interesting is that the President has deliberately chosen to have this tried in the court of public opinion even when an investigation he sanctioned is underway. It strikes one as rather undignified and well un-presidential. The idea that the President, any President would expend so much energy on public squabbles with anyone is beyond this writer. Wouldn’t the debacle be more appropriately handled by the relevant Ministry? In sharp contrast, Magande says he has and will continue to make himself available to the relevant authorities. The President is right, that kind of money could have gone to schools or hospitals or of the basic infrastructure so badly needed. That said, an investigation is underway, wouldn’t the President’s time and energy be better spent finding ways of building the infrastructure and basic necessities he is rightly concerned about? At a time when the Zambian economy is taking a major beating, this Zambian would like to see the President focus on diversifying the economy, attracting investments and creating new and innovative programs to support the educational, health, agriculture and micro enterprise development. The President insists he is being attacked, that maybe so but the public snipping is enough to make one think there is something more. Could it be the new President is trying to assert himself? Is it possible by focusing on someone else, he hopes, the Country will not take a closer look at him? These are just questions; I have no answers but think they are worth asking. I do not care about Mmembe but I do care very deeply about how my President chooses to conduct himself. Very Intelligent blue sky thinking from Magande. He was merely suggesting the most appropriate way to save ZA. Honestly he broke no law. Neither is he a thief as alluded to by the MMD’s cadre types.I dont know what the suggested Tribunal is going to investigate. I wouldnt mind sitting around a table with him discussing ways and means of rescuscitating the Zambian enterprise. … it is unfortunate that the MMD as a party likes to play to the circus by elevating issues of no relevance just to rumble rouse. What is even more pathetic is the way they like to conceal pertinent details but only release piece meal kind of info best suited to meet their objectives. It would be very presumptuous of ZamChro to make any conclusions here since the matter is being handled by a tribunal we are given to understand but that aside let this be a lesson to all of those who think they can disseminate only favorable piece of info to keep the public at bay and or ignorant of details. It has really been disheartening to read government sponsored papers only cover one side of the story protecting the plaintiff like they do no wrongs while at the same time reading totally different scenarios from the other side covering the defendants like they are innocent until proven otherwise either. Journalism within the Zambian Enterprise is dead. Objective is no longer the impetus on which this noble profession has relied for centuries. Subjective has become the order of the day having thrown realism out of the window and newspapers are now being used as court room. 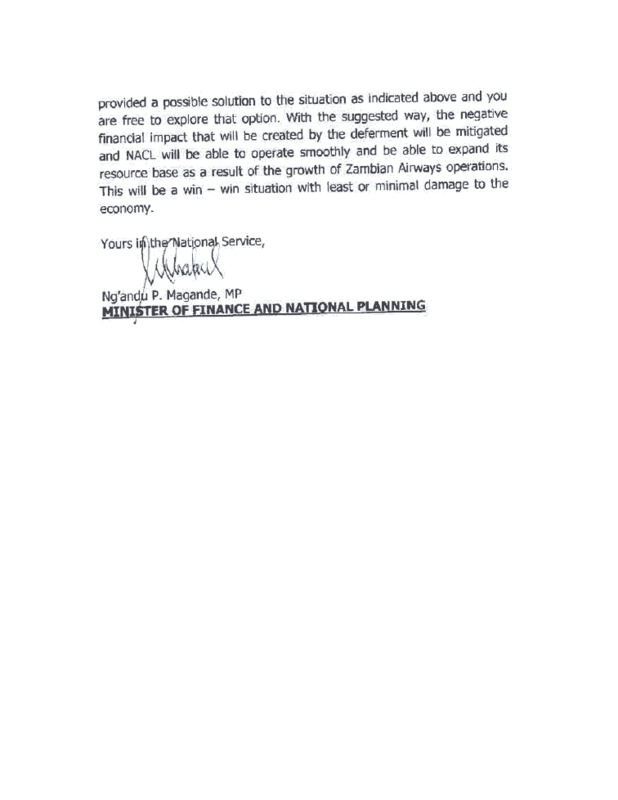 Please, please fellow country men and women; we are Zambians for crying out aloud. We are the best when it comes to handling stuff like that. We need to get back to the basics all of us from the presidency all the way to the grassroots. Here at ZamChro we are committed to finding out the truth and nothing but the truth because Zambia Is Greater Than Any Single One Of Us!!! Other say they dig deeper as they cover up at the same time, around here we cover up nothing, we are only interested in revealing the truth and nothing but, so help us God … thanks a trillion. NB: When this tribunal thing is over with we shall then issue a more detailed opinion on this matter. But Zoona pa Zed. Why? ZamChro that’s why we love you guys, you don’t take sides. I see a lot of potential for you guys if you play your cards right. Ba RB is a sham, please vote wisely next time … please.